Please note these are the 2019 rules, the 2020 competition rules will be updated shortly. 1. The Competition is open to all instrumentalists, pianists and singers of any nationality; organists are at present excluded. Applications are only accepted from singers within the Senior Section – see Rule 2. 2. There are two sections in the Competition: a Junior Section and a Senior Section. Applicants for the Junior Section must be at least 9 and no older than 13 on 1st May 2019, and for the Senior Section at least 14 and no older than 17 on 1st May 2019. They must be resident in or in full time education in Worcestershire, Gloucestershire or Herefordshire or in the West Midlands inside a radius of 30 miles of the centre of Bromsgrove. 3. All instruments used must be completely acoustic (not electronic) and the use of backing tracks is not permitted. 5. 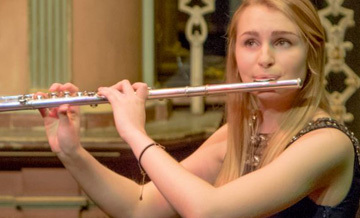 Applications should be completed online or submitted by post to The Bromsgrove Young Musicians Platform, c/o Alison Webber, MFG Solicitors, 1 High St, Bromsgrove B61 8AJ. Applications must be received no later than 16.00 hours on Sunday, 3rd February 2019. The Trustees acting through its Competitor Selection Adjudicators may accept or reject applications at their discretion. 6. Proof of age must be submitted with your application by post or by e-mail. This can either be a copy of a birth certificate, passport, or ID card. Please see the Application Form for details. 7. Applicants for the Junior Section must have attained a standard at least equivalent to Grade 4. 8. Applicants for the Senior Section must have attained a standard at least equivalent to Grade 6. It is imperative for competitors to keep to these time limits. 10. Competitors on arrival at the Routh Concert Hall on the day of their Audition and performance in the Finalists' Concert (if selected) must hand-in to the administration desk for the Adjudicators' use, three copies of a score including accompaniment of each piece of music to be performed in that round. For the avoidance of doubt, it is the competitor’s personal responsibility to ensure that there is no infringement of copyright in the submission and/or use of any photocopy. 12. The list of music the competitor wishes to perform in the Competition must be entered on the Application Form. However, competitors may alter a maximum of one piece per round. The change must then be communicated by email to the Competition Administrator at least 24 hours prior to it being played. 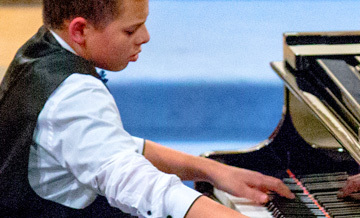 Competitors are expected to provide their own accompanist. 13. Competitors will be advised shortly after the closing date for entries whether they have been accepted for audition and the date and time of their performance in that round. The playing order of competitors for auditions, the finalists' rehearsal and the finalists' concert will be determined by the Competition Administrator whose decision shall be final. 14. Competitors must arrive at least 30 minutes before their allocated performance time for their audition. If selected for the finalists rehearsal and concert again they must arrive at least 30 minutes before their allocated times. 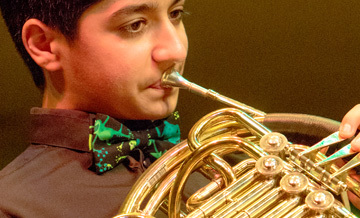 They must notify their arrival to the Competition Administrator's staff at the administration desk at the Routh Concert Hall Bromsgrove School, Worcester Rd, Bromsgrove B61 7DU where the auditions, the finalists rehearsals and concert will be held. 15. Competitors must be accompanied at all times by a parent or guardian. 16. Competitors and their parent/guardian accept that by entry to the competition they unconditionally agree that their competition performance(s) may be recorded or broadcast in any media form by the Bromsgrove Young Musicians’ Platform acting on behalf of The Bromsgrove International Musicians’ Competition for use at the Trustees' discretion wholly or in part, without payment of any fee to the competitor or their parent/guardian, to promote the Competition and/or to raise funds to support the Competition. Copyright in such recordings shall be the intellectual property of The Bromsgrove International Musicians’ Competition. 17. Finalist Competitors may purchase a copy of their recorded performance. Applications may be made online after the end date of the Platform to marketing@bromsgrovecompetition.com. Payment of £25.00 GBP per round recording must be received through BIMC bank account sort code 30-63-94; account no. 30002260 before the recording can be downloaded. Please allow 14 days from the date of payment for delivery. For the avoidance of doubt such recordings are supplied strictly for the Competitor's personal use only. If required for public performance of any kind then it is the Competitor's responsibility to contact the PRS. 18. As a matter of custom and rule, no First Prize Winner may enter the Competition again in a subsequent year unless as winner of the Junior Section they become eligible by age to enter the Senior Section. 19. Prize monies will be paid for the furtherance of the winner’s musical education and for no other purpose. The monies may for example be used to pay in whole or in part for additional lessons from an accredited teacher, the purchase of instruments, and/or the purchase of musical scores. Such monies will only be paid direct to the accredited teacher and/or supplier(s) and not to the competitor or parent/guardian. - be a self-employed independent music teacher. If there is any doubt whether a teacher nominated to receive prize monies is an accredited teacher under this Rule, you should send his or her CV including qualifications and contact details to the Competition Administrator, who will make a final decision. 21 The Trustees of the Bromsgrove International Music Competition reserve the right to amend any if these rules without notice. 22. In the case of any difficulty that a potential competitor may have in meeting the requirements of the rules they should contact the Competition Administrator.